Organic Stretch Mark Oil GIVEAWAY! OK ladies- it is that time again! Giveaway time! This week our giveaway comes from one of our sponsors, Avishi Organics. They are donating one bottle of Intensive Repair Oil! You can read more about it HERE on their website. 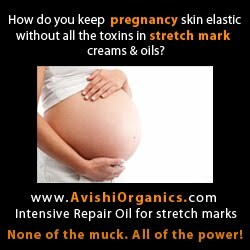 "Avishi Organics Intensive Repair Oil activates skin renewal to visibly minimize the appearance of existing stretch marks and scars, as well as reduce the possibility of new marks forming during pregnancy. It is free from chemicals, fragrances, colors, parabens, sulfates and other toxic ingredients, and is safe for use during pregnancy and breastfeeding." Here are the SIMPLE rules! 1) Go to their FACEBOOK PAGE HERE, and like it. 2) Comment here, on my BLOG. PLEASE for the love of my freaking sanity, leave your e-mail address and answer it if I e-mail you! I will temporarily allow anonymous comments so all can comment. 3) WAIT. Contest closes Wednesday night and I will try to announce the RANDOMLY chosen winner on Thursday morning. Will it work post-pregnancy? I somehow never got the message that you were supposed to oil up *while* your skin was stretching, rather than afterwards....whoops! Liked! Sounds like good stuff. Thanks for the giveaway. Aah! I would love this! Good timing for me, I'm pregnant right now! I would love to try this as long as it is not sticky or smells bad (my reasons for giving up other lotions, oils and creams). I love my tiger stripes, but I wouldn't mind toning them down a bit. Organic stretch marks Oil is really important for the pregnant women to safe their skin. I first read about that giveaway. thanks! I never got stretch marks until I was 40 weeks....I went over my due date by 11 days and those 11 days did a number on my belly! ;) I am currently preggo with baby #2 and would love to try something this time!! ohhh...I've always wanted to try this.